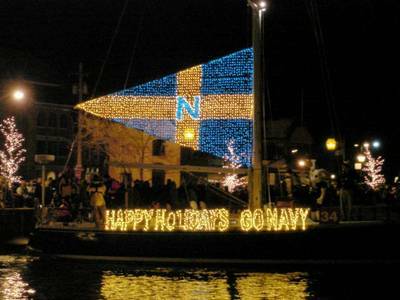 2011 November | chesapeaketidings & more..
As Christmas approaches, preparations for theannual Annapolis Parade of Lights are well underway. 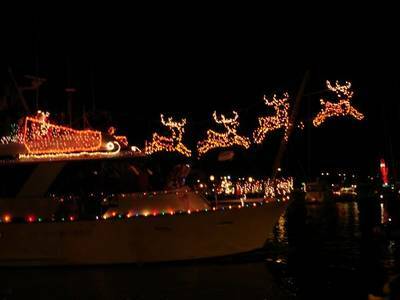 This annual evening eventin Spa Creek attracts over two dozen boats both power and sail, each with elaborate Christmas themedecorations presented in multicolored lights. Boats circle Spa Creek above andbelow the bridge linking Annapolis to Eastport. The bridge and other areas witha view of the creek are filled with folks who brave the usually cold evening toenjoy the colorful boats. Many boating clubs enter their best designs to compete for prized titles. 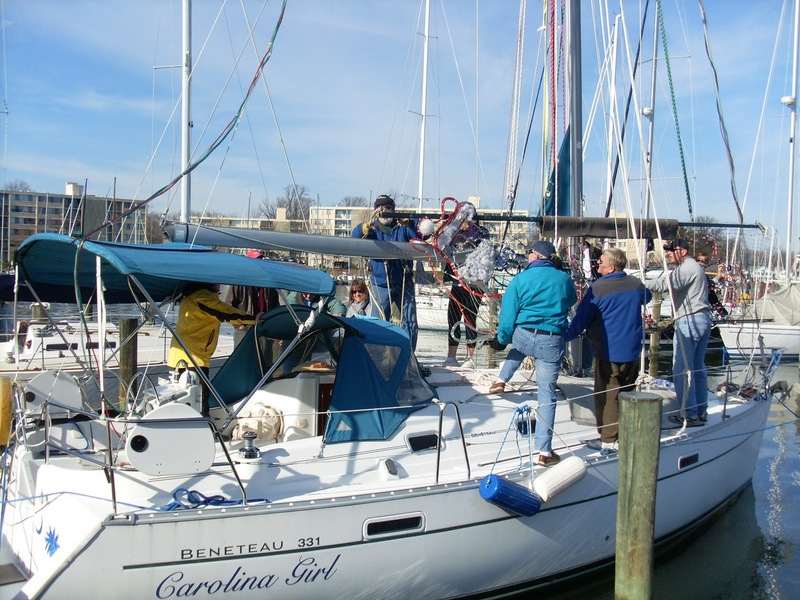 Singles on Sailboats (SOS) has entered each year for 15 years, and received prizes in many of those years. 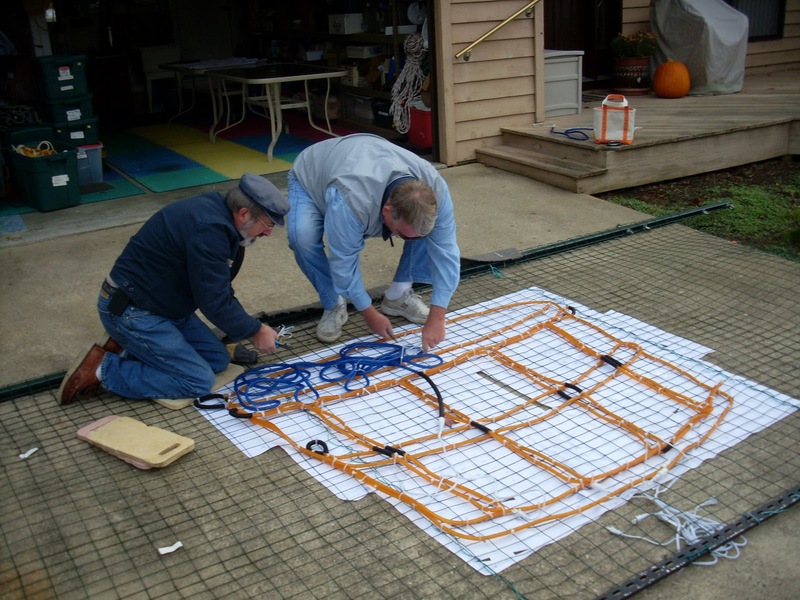 Lest you think this is a simple undetaking and just means stringling some lights on a boat – here’s a brief look at the preparations required. First, someone conceives of a novel design (with all the engineering and electrical considerations) and prepares full scale drawings. 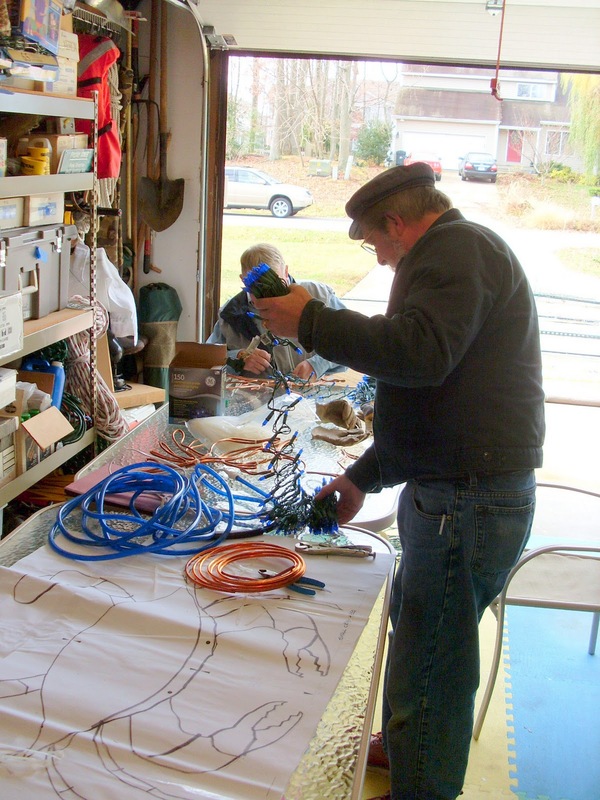 Frank Florentine, a professonal lighting engineer and SOS member, provides these volunteer services. 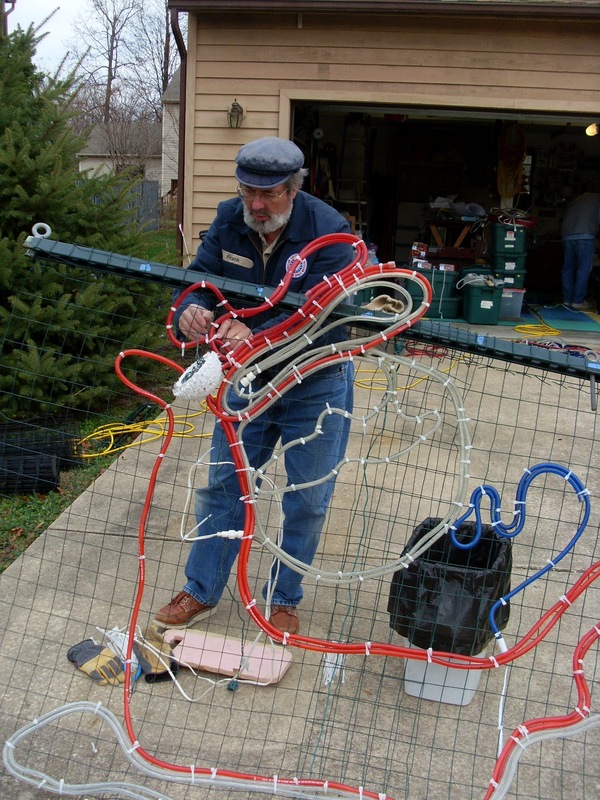 All the light strings, tie wraps, wire mesh, extension cords etcare hauled from storage and last year’s designs dismantled. 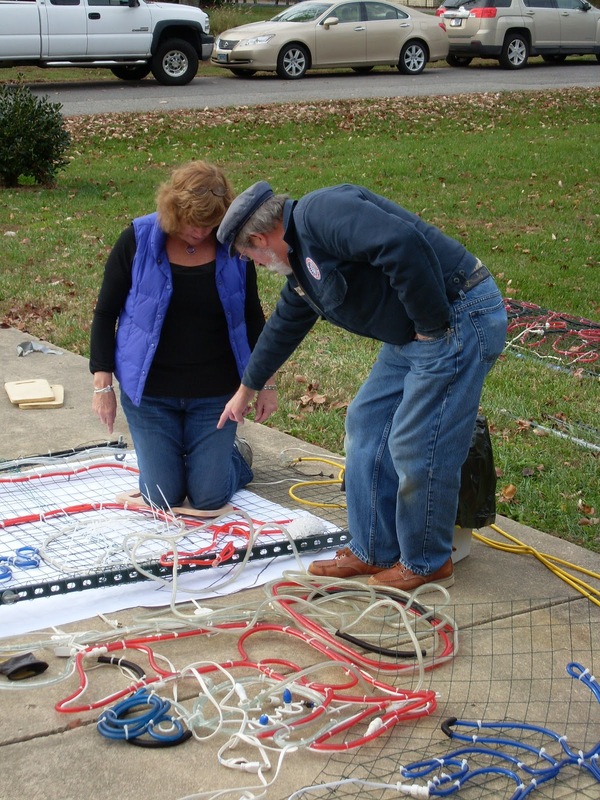 Wire mesh is laid over the new drawings and lightstrings are tied on to outline the designs. Pictures begin to take shape and come alive aslights are tested. All the work is done under the direction andwatchful eye of our designer/engineer Frank. Light strings are checked to besure they’re in working order, and the representation of the design materializes as planned. 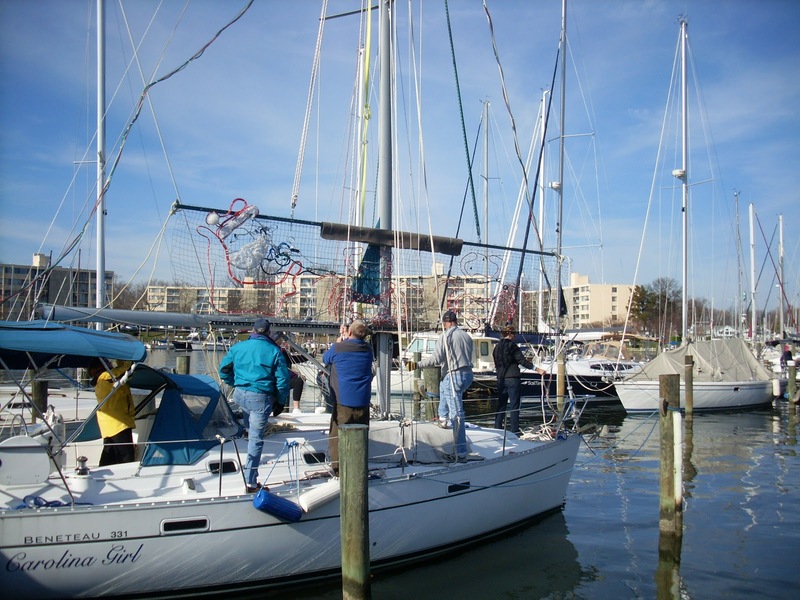 When all is completed, it gets hauled to theboat and rigging begins to safely raise the completed designs up the mast andattached wherever else is needed…. 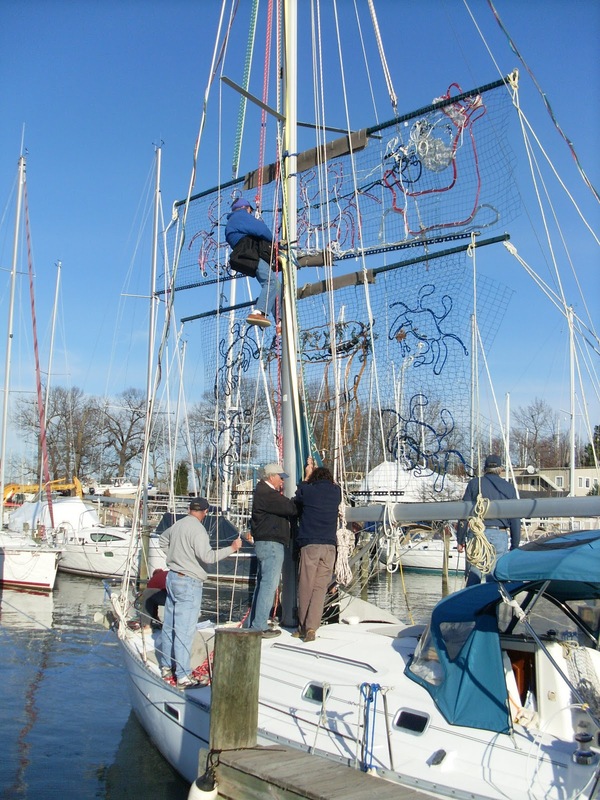 .. and it takes a few hands to sort out the rigging………..
It’s a neattrick to get it all up a 50ft mast in the right orientation and secured forwhen the boat is in motion! 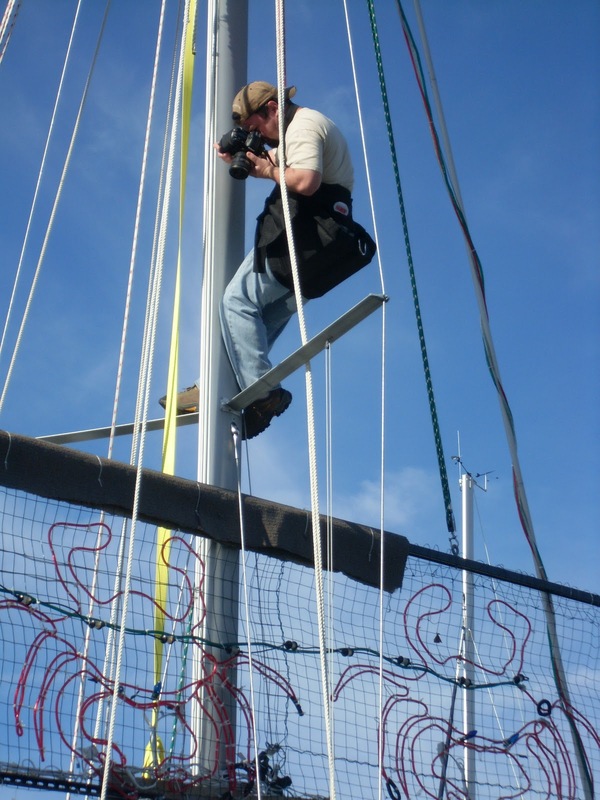 We even hauled a news photographer up the mast in the bosun’s chair to help him get some good pictures! Here’s a short clip of some of the perparations …. We think this year’s entry is boundto garner support of the judges!! 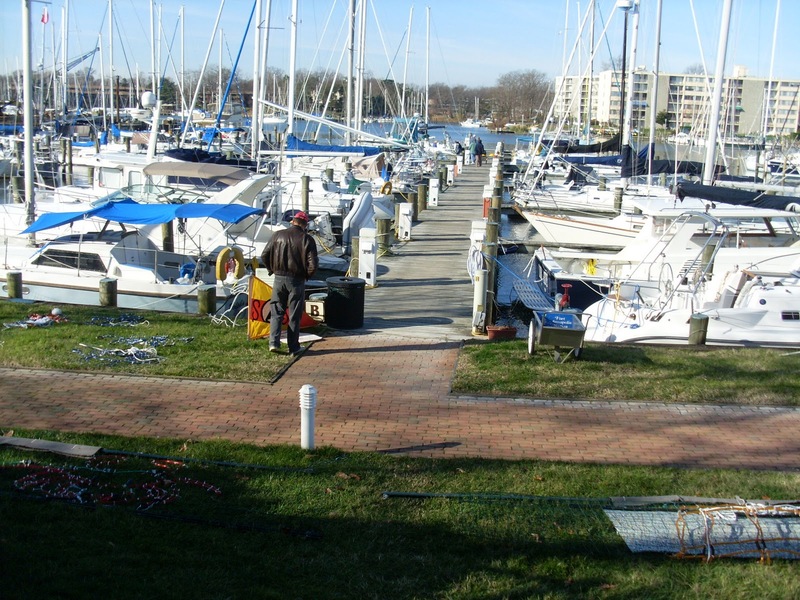 Although the cruise south to warmer weather got postponed to next year, being an optimist by nature, the final steps in winterizing are deferred till serious freeze warning are issued. That said, the process got underway this past weekend. Except for cushions, all the fabric materials came off the boat, as well as all the non-dried food supplies. Battery levels were checked, antifreeze was pumped through the fresh water system, and a heater set up for possible chilly nights on board. 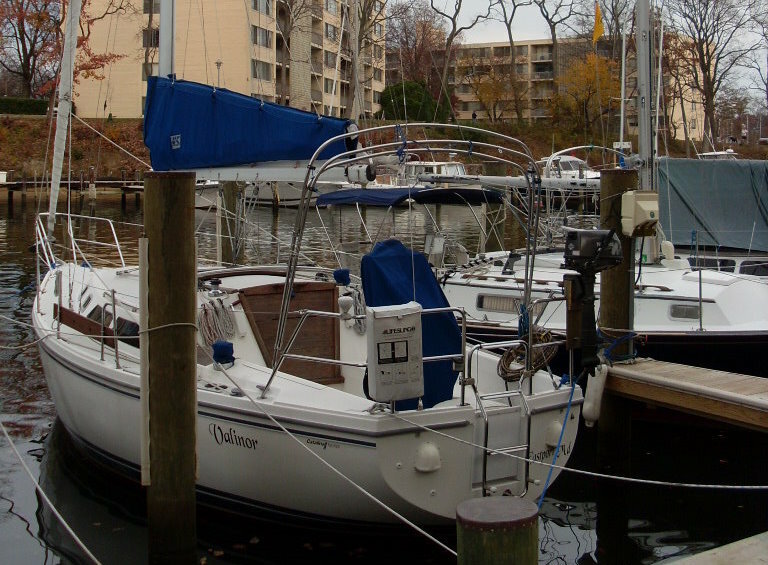 Bimini and dodger are home for cleaning and repairs. To make access easier for when the tarp goes on to cover the cockpit, Valinor is now in her slip stern first. Water depth is a concern in this slip, but it measured 4.3′ at low tide leaving about 6″ of clearance. Likely she will rest on the bottom at an occassional very low tide. When all prospects for sailing are gone, sails and cushions will come off and brought home to clean for next season. 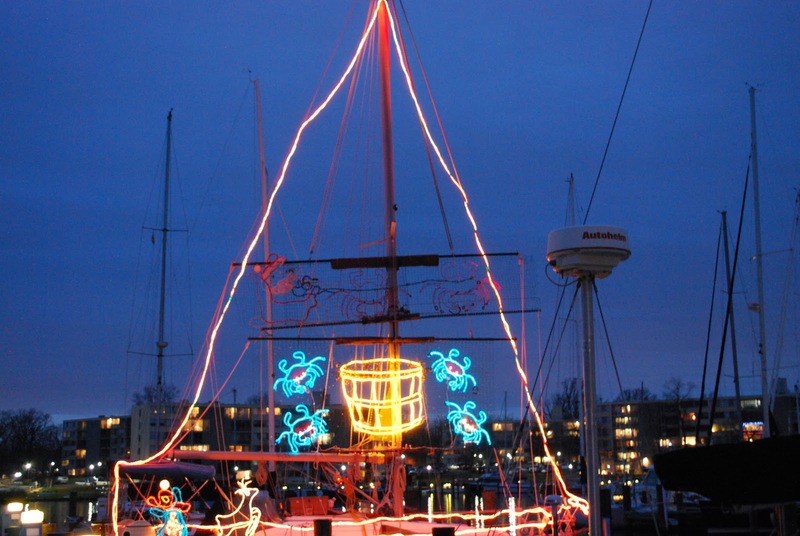 Each year the SOS club decorates a boat for the Annapolis ‘Parade of Lights’. They do a very professional job and always have an imaginative design. 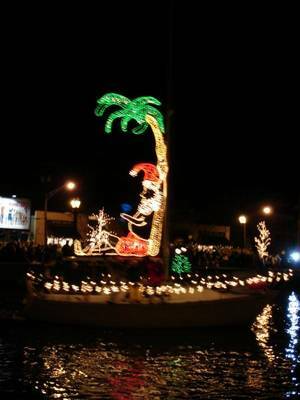 I got a ride on the Parade boat a couple years ago, and signed up for the work crew this year. So Sunday afternoon was spent hauling supplies from storage, cleaning up from last winter’s work and begining the process of putting together this year’s light deisgn. Lots left to do, but it looks to be another great boat! Pictures later……. Looking forward to next season, I spent a half day attending a weather seminar presented by the Bermuda Ocean Race committee. Early preparation for those who plan to particpate (or might). The instructors were professional meterologists from the Naval Academy. Lots of good information! Finally learned how to interpret the 500mb chartsL The BOR starts just off Annapolis, goes down the Bay then off shore to Bermuda – start date is 8 June 2012. 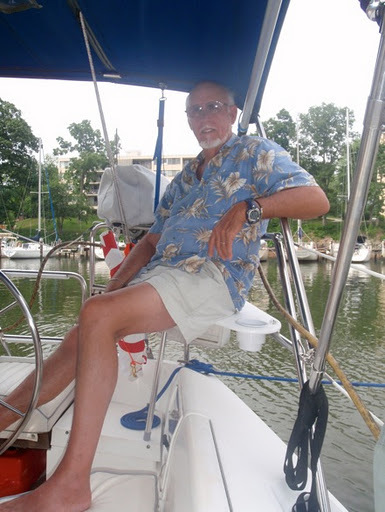 As this season comes to an end, I’m taking stock of past improvements and consideringplans as I look forward to next season……..
Everyone who owns, or has ever owned, a boat knows it isalways a work in progress! Some is simple maintenance, some major ‘renewal’ ofcritical components or repairs, but some is investment to improve comfort,performance or safety. Now in the 4th year with Valinor, we’ve donemost of what was on the ‘LIST” …… rebuilt the helm, upgraded the battery system,improved galley storage, added a cockpit table and stern seats, and replacedthe Dutchman with a new UK Lazy Cradle system (with sail modifications for aloose-footed main). We added 30 morefeet of chain to the anchor rode providing 60ft of chain and another 90ft ofrode with a Danforth and small plow riding on the bow. 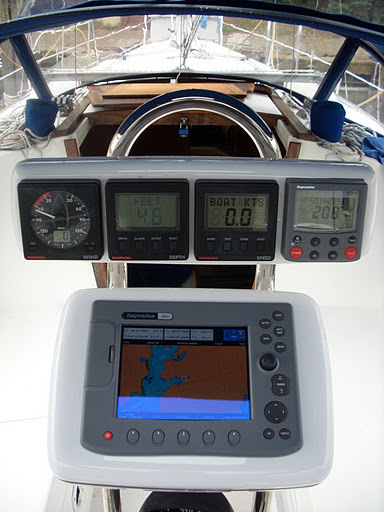 I decided to add a C80 chart plotter to thehelm – and later a wheel pilot. To makeroom and accommodate the new wiring, the old single, straight 1” guard was replaced witha new 1 1/4” double bend guard and two new instrument pods to provide for theplotter and the X5 wheel pilot control. The old, cranky windex system has also been replaced. These changes made single-handing simpler, and with a newDSC radio and RAM at the helm, much improved safety. 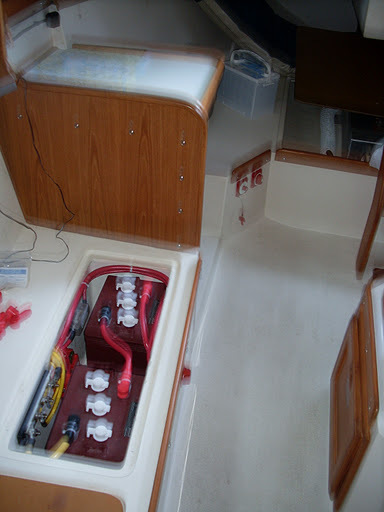 Batteries – More electronicsand longer cruises placed greater demands on my single, limited 12V housebattery. The standard two 12v batteriesand switching were replaced with two 6V in series for the house bank and astandalone 12V starter controlled in such a way that only a dead starter wouldrequire connecting to the house bank. Upgraded to a new 20A Xantrex charger. This season we added a Xantrex batterymonitor to track usage and provide real-time information on battery state ofcharge. These changes raised the house capacity from 80ah to about 180ah,and the related changes in wiring (heavier gauge and shorter run) greatly improved starting power. 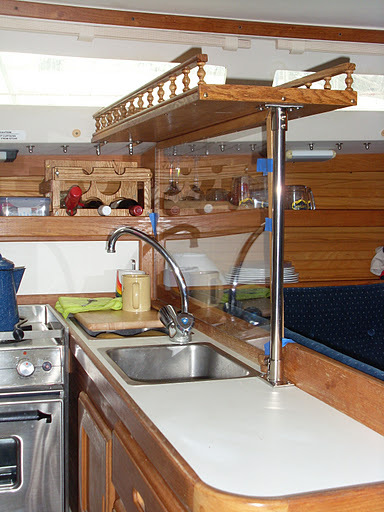 Galley – Any 30ftboat is limited in storage space. A criticalimprovement was the addition of a small wine rack J. Also, an over-the-sink shelfadded greatly to convenient storage. Including a plexiglass panel protected thesalon cushion from spray from the sink. 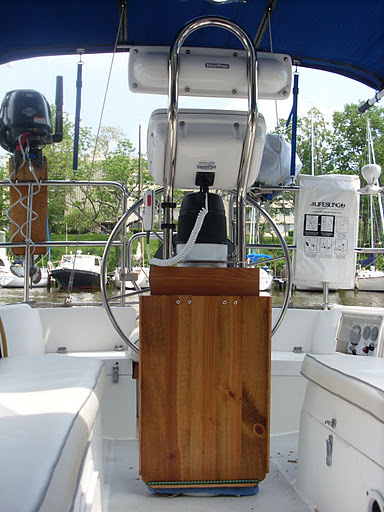 Cockpit (table andstern seats) – Finding so much time spent on deck, a cockpit table wasessential. After choking down the cost of a ‘convenience’ like the stern seats,we’ve come to appreciate that nicety, and wondered why not sooner. With plans in the works for longer cruising, energy storageis rising up the otherwise shortening list. Either generator or solar seems the bestsolution, but will have to wait. As will cabin heat, either propane or diesel. Trying not to think about replacements: sails, canvass, standing rigging, or theaddition of an asymmetric drifter. 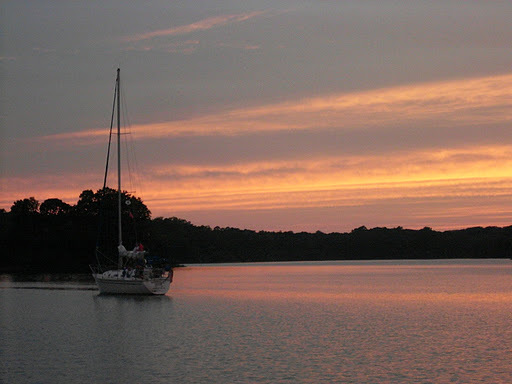 So, I guess it only ends when the boat is sold, or when timeruns out …….